The Merlin is a small, compact, and powerful falcon that breeds across the northern forests and prairies of Alaska and Canada, Europe and Asia. It winters from southern Canada to northern South America, and can occasionally be seen in Tennessee during migration, and rarely during the winter. Its former name was "pigeon hawk" likely because this falcon resembles a pigeon in flight. Description: This small falcon lacks the strong facial markings of other falcons. It has short, pointed wings, a long, banded tail, and brown streaking on the chest and belly. The back is solid gray in adults and brown in first-year birds. Females are noticeably larger than males. American Kestrels are slightly smaller and more delicate in appearance, with well defined facial markings, and a rusty, barred back. Kestrels will over when foraging, where as Merlins have a powerful, directional flight and do not hover. Sharp-shinned Hawks have rounded wings. Habitat: In Tennessee, found in open areas and along rivers. Diet: Mainly small and medium sized birds, mostly caught in the air. 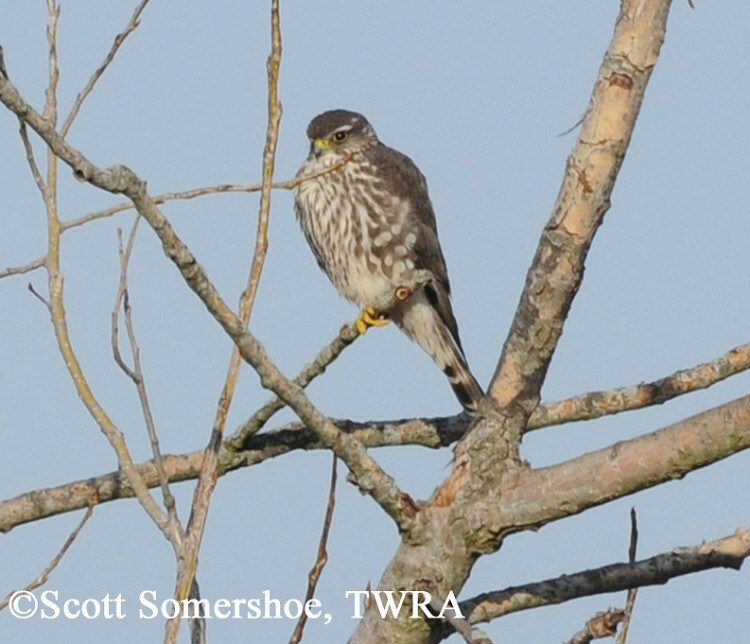 Status in Tennessee: The Merlin is an uncommon migrant and rare winter resident across the state, arriving by mid-September and departing by late April. In Medieval Europe, this falcon was used in falconry and was known as a "lady's hawk." Catherine the Great and Mary Queen of Scots were among the more famous falconers. Merlins do not build a nest, but instead refurbish old nests of other raptors or crows. The oldest known Merlin in the wild was 11 years, 11 months old. Best places to see in Tennessee: Though always uncommon, most likely to be seen between mid-September and late April in any region of the state. Warkentin, I. G., N. S. Sodhi, R. H. M. Espie, Alan F. Poole, L. W. Oliphant and P. C. James. 2005. Merlin (Falco columbarius), The Birds of North America Online (A. Poole, Ed.). Ithaca: Cornell Lab of Ornithology; Retrieved from the Birds of North America Online.